Ed K grew up in the San Francisco Bay area with music in his ears, listening to records and “Top-40” AM during the early 1960s. Once he began earning enough money, he started his own collection of 45 RPM discs. One day, while tuning around on his dad’s FM radio, Ed found a station playing three and sometimes four songs in a row — without loud commercials or a DJ coming on and screaming about some product or event. What he heard were the “B sides” of commercial 45s, and sometimes multiple songs from an album. Ed was hooked, listening to underground radio stations and going to concerts by local bands. Music became his lifelong love. 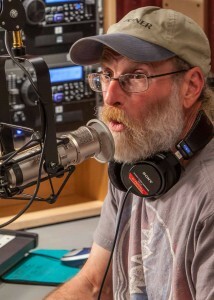 In the early ’70s, Ed moved to Eugene and experienced the great local radio scene. Some years later, Ed’s step-son was a student in KRVM’s educational program and, in 1994, Ed found himself at KRVM, learning the ropes. When the Magical Mystery Tour host slot opened, he brought records from his collection and found his calling: playing music for all his friends and neighbors on KRVM.